NO ROOMS AVAILABLE- FESTIVAL OF SPEED. 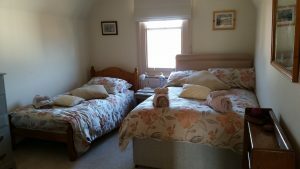 Should you wish our smaller double room with feature arch windows and a beautiful view of the garden, or, our larger family room with small double and single bed please telephone to see if Susan and Herb have availability. Ideal for the Chichester and Portsmouth area. Price: Generally £60 per room/per night including a quality continental breakfast. There is an extra £5 charge per night for a 3rd guest in the family room. Prices are increased in summer months. 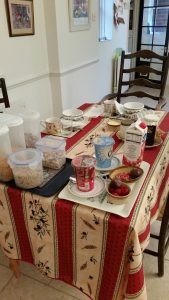 The Continental breakfast offers cereal, fresh fruit, yogurt, juice, tea/coffee, toast and a selection of jams, and eggs. Should both rooms be requested the charge is £120. PLEASE NOTE: Our 2 bedrooms are on the top floor. The rather steep second staircase is NOT suitable for those with mobility issues, nor for very young children. However not hugely problematic. The 2 Guest Bedrooms have sole use of the family bath/shower room. ** Should both rooms be booked separately then sharing the family bathroom is required. The bathroom suite is fresh, modern with bath and shower. Weekly and monthly rates are potentially available. The rooms have a quirky Victorian style and offer flat screen television with freeview, tea and coffee making facilities, free Wi-Fi, hair-drier and complimentary mineral water. Village amenities: Good pubs, golf, tennis, The Green -where it all happens! restaurants and a direct train route to London Waterloo; Havant five minutes away offers many routes all along the south east. Want to eat out in the village? We have 2 cats; guest pets are not allowed. Sorry. Visit Portsmouth, The Historic Dockyard and the Mary Rose Museum. Taken from our airbnb listing. 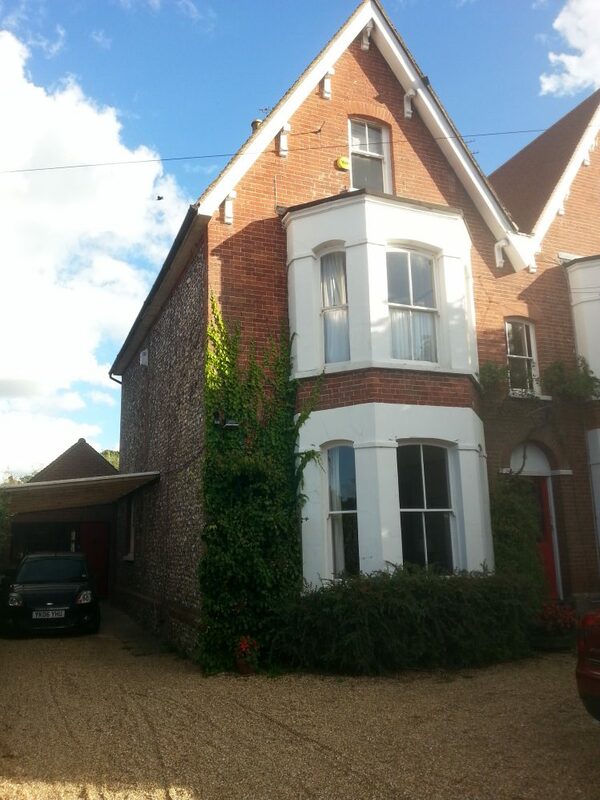 Sue: “Very relaxed and welcoming hostess,who provides great chat and a great breakfast. Home from home. My second visit and as good as my first.” AirBnB February 2016. Susan was welcoming and friendly. The room was clean and cosy and provided everything I needed. Breakfast was generous with fresh fruit and plenty of choices. I will be sure to stop in again if I am working in the area! Good welcome, Just what I wanted from room in nice area. Thank you to Herb who looked after my daughter and I for one night before we set sail on a mini cruise! The bedroom was clean and fresh, had everything we needed and the shower was good. Lovely breakfast the next morning with lots of fresh fruits and cereals/yoghurts which set us up well for the next day. I really liked the information sheet Susan emailed me prior to our stay. Nous avons été très bien accueilli par Susan qui a fait en sorte que nous ne manquions de rien. Etant intolérant au gluten et au laitage , j’ai pu apprécié le soin que Susan a pris pour confectionner un petit déjeuné très copieux compatible avec mes intolérances. (lait , yogourt, pain , céréales.) La chambre correspondait parfaitement à la description avec thé , tisane bouilloire. Le quartier résidentiel est très calme et très agréable. Possibilité d’aller boire un verre au pub à pieds. “Both myself and my daughter had a lovely time staying with Sue and Herb, and would recommend them to anyone. “It was a pleasure staying at this place. Susan and Herb are amazing hosts! 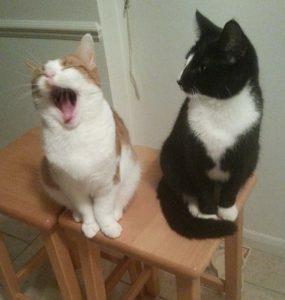 The cats are cute, and they went about their lives without any disturbance to us. Rowlands Castle is beautiful, and easily accessible by train. This was important to me, as I used public transportation all along.” Satish from Bengaluru, India · May 2015. “Susan was the perfect host. The room and house where clean and tidy. She ensured we felt welcome and provided an excellent service. I would highly recommend this house to other travellers.” Jon from London, United Kingdom · April 2015. “Very nice clean room thank you. Felt very at home as able to help ourselves to breakfast. Lovely stay.” Joanna December 2014. “Lovely house in a very pleasant neighbourhood. Susan was very friendly and welcoming and provided exactly what we needed for our short stay. Rooms were very comfortable and clean”. Juliet. November 2014 2 bedrooms. “Everything was perfect, Susan and her home were fantastic”. Iain from London, United Kingdom · October 2014.